The Cheesegrater is a beautiful glass wedge of a building that rises over 700 feet into the London skyline. It unfortunately has some safety problems. This week, its owners revealed that a third bolt of high-strength steel snapped because of "hydrogen embrittlement"—an obscure term, but one that "causes fear among engineers." 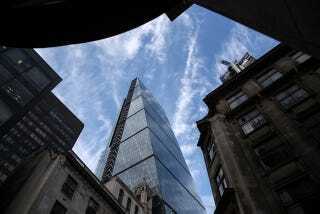 The Leadenhall Building, as the Cheesegrater is formally known, was completed just last year—one of the many skyscrapers cropping up to transform London's skyline. In November, two arm-sized bolts made of high-strength steel broke, and the debris fell to the ground. Some 3000 of these bolts hold the Cheesegrater together, and the Guardian reports dozens of them are now being replaced. Not fast enough evidently, because now there's been a third; three in as many months. This time, at least, it was caught by tethering before it crashed into the ground. [T]here is a consensus on the basic mechanism, which is that single atoms of hydrogen enter the steel, migrate through the crystal lattice, and are attracted to the areas of highest stress. Here they cause tiny fractures to propagate and, in a worst-case scenario, a cascading effect can take place, as the stress increases and attracts more free hydrogen, leading to a sudden catastrophic failure – such as the shearing of a bolt.